I haven’t written a post about what I am reading in quite a while. Do you remember my pause from reading the last portion of 2012? Well, it was a wonderful hard time. It felt wonderful to be fixed in one direction…reading the Word. Hard in that, I love reading books. It’s was like fasting from sugar. Everywhere I roamed, it suddenly felt like there were sweet landmines everywhere. It seemed like every blog post I read was about favorite books. I just grabbed paper and pen and compiled a list of all those gorgeous books. During that time, in the midst of seeing flashes of light, I discovered my need for glasses. My new glasses are pictured above. My world had been thin light grey type and now it is suddenly black boldface print. It has been a revelation! Cue the choir of angels singing Hallelujah! But is it just me or do other glasses wearers have to clean their lenses every two minutes? It’s been an adjustment but seeing is worth it. It definitely makes reading more enjoyable! The new year has found me with better sight and eating a lot better. 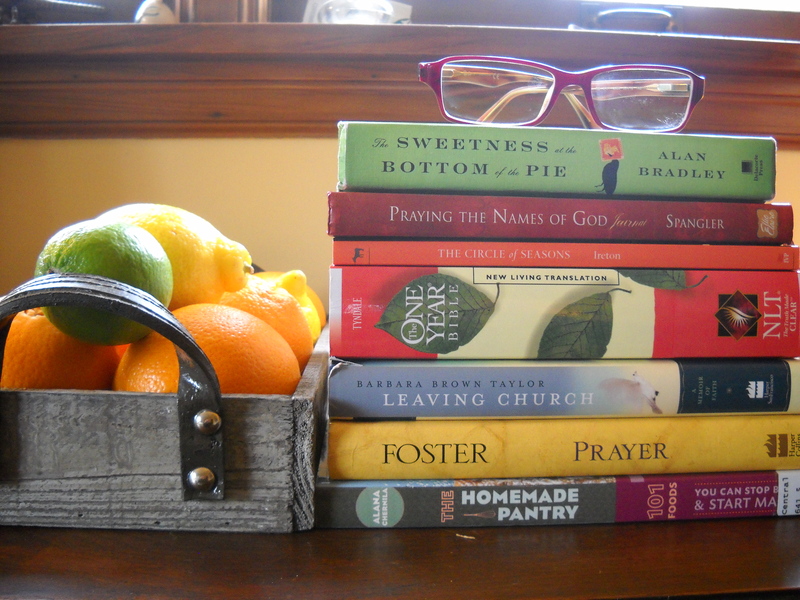 Thus the beautiful colors of fruit next to my book stack! This is the first book in the Flavia de Luce mysteries. I found it for pennies at the Goodwill, which I am finding to be a goldmine lately. I started this using this journal at the end of last year. It’s a great part of my morning routine. I haven’t used a One Year Bible in a long time. I tend to pick a reading plan and go from there. without a lot of page turning. after last year reading The Message. Did you know Lent begins the next week? I want to be more connected to the church calendar. to where in the church year we resided. contact information. I love that! She’s from Seattle. computer or e-reader when you subscribe to her newsletter. I am sure I won’t want to get to the last page. There are usually blog posts and videos throughout the week. What are you reading during the month of February? it’s up on the site!